I’m proud to say that this is my first report card as a vice president of Covario. The company I founded in 1995, Netconcepts, was acquired last month by Covario, a search-engine-marketing and search-engine-optimization software and services company for large online retailers. This month we’re looking at Juggle.com. Juggle has been around for about a year; it is still a very young company. Founded by Stephanie Leffler and Ryan Noble, it was Leffler (the CEO) who requested the site grade. If her name sounds familiar, it’s because she co-founded MonsterCommerce, the pioneering hosted shopping cart that she sold to Network Solutions. You may, in fact, have recently read “MonsterCommerce Co-founder Stephanie Leffler ‘Juggles’ New Venture” here in Practical eCommerce. Leffler graciously shared Juggle.com’s traffic numbers with us. It received 700,000 unique visitors in Dec. 2009 and was on track to hit 1,000,000 for Jan. 2010. Those are impressive traffic numbers; clearly they are doing something right. Let’s talk about Juggle’s business model for a moment, because it’s pretty unusual. Juggle is not your traditional ecommerce site. It’s in a different class known as “content aggregators,” sites that gather content from multiple data sources, such as Wikipedia. Comparison-shopping engines and a great many of the affiliate sites out there fit into the category of content aggregators. Content aggregators face a difficult challenge to not be seen by Google as a “thin affiliate” full of duplicate content that’s simply been regurgitated from other sites. A site has to be sufficiently value-added in order to pass Google’s sniff test. Clearly, comparison-shopping engine sites like BizRate and Shopzilla would qualify in this regard. They are both one-stop shops to compare pricing and find the best deals from only reputable retailers, a real value to consumers. Despite the impressive traffic and some SEO elements done well, such as the great URL structure and clean HTML code, I saw in my stroll around the site a lot of room for growth. One key opportunity area is the optimization of title tags. Title tags are very important; it’s worth the time to get them right. On Juggle.com they are a bit minimalist (e.g. the Wii games category page is titled simply “Wii | Juggle.com”). And they’re not in the best word order either, as far as what’s popular with searchers. For example, the title tag “Action Nintendo DS Games” should really be “Nintendo DS Action Games” as that’s more likely the phrase that customers would use. If you are thinking, “But “nintendo ds games” is a more popular term to focus on than “action games”, you would be correct. But the category page that is one level above (I am referring to the “Nintendo DS Games” page) is much better suited to rank for that phrase. Whenever I see a block of keyword-rich text buried at the bottom of the page, I think to myself “What is the purpose of this copy?” I doubt it’s meant for human consumption. Especially when this copy is on important pages like all the secondary level pages (e.g. the Education page). To me it looks like SEO copy written for search engines and tucked away so humans don’t read it. I bet Google sees it the same way. I would move that up the page so it looks less suspicious. The home page lacks a keyword focus. (This is not as much the case for the newly redesigned version; better, but is still weak). 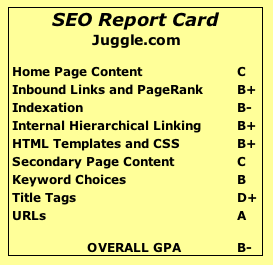 What is Juggle trying to rank its home page for? “Juggle the world’s information”? What does that even mean? For a first-time visitor coming from Google to the home page, the “Juggle the world’s information” headline doesn’t offer a readily apparent value proposition. This will result in a high “bounce rate,” which Google is bound to notice. Also, in my view, there are too many links on the home page. A “site:juggle.com” query shows 47,000 pages indexed in Google. That’s not a bad number, but I would have expected better for such a large content-rich site as Juggle.com. The PageRank really falls off quickly, too, as you go deeper down the site tree. The home page registers a PR5 with the PageRank meter in the Google Toolbar, but go two clicks deeper and the meter registers PR0. That’s not good. If it were a brand new site, this would be understandable because it takes several months for PageRank scores to get exported to the Toolbar Server. With a steep drop off in PageRank like this, it’s not surprising the indexation suffered. Poor PageRank = poor crawl equity = poor indexation. Inbound links (including deep links) are at around 5,800 according to Yahoo! Site Explorer. This isn’t horrible, but it’s nowhere near enough to seriously compete in all the keyword markets Juggle is targeting. And PageRank 5 is a lot worse than middle-of-the-road. Five is not halfway to 10, because remember: PageRank scores are on a logarithmic scale. And looking at some of the links it looks like someone’s been employed to comment on blogs with a keyword-rich first and last name and they just so happen to have a home page URL that corresponds perfectly to the topic page for that keyword. This is not a tactic I’m a fan of. It just doesn’t look natural to spiders or humans. Can you imagine hearing a mother calling to her son: “Killzone? Come in please! And bring WordPress in with you, he’s welcome to stay for supper”. Surely this must stick out like a sore thumb to Google? If I had to pick one main issue that’s holding Juggle.com back, it’s duplicate content. There’s lots of upside potential if they manage to crack this nut. The answer is simple: differentiate. The articles need to be augmented with a lot more unique content. That doesn’t mean simply developing sentences around a bunch of statistics, which is what the “Frequently Asked Questions” on articles appear to be (see the Frank Sinatra page for an example). It’s going to require writers and editors. Content creation is expensive, but well worth the expense and effort.